In the 1950s, neuroscientists putatively identified dopamine as a cause of psychosis and targeted blockade of the dopamine receptor to manage the symptoms of schizophrenia and psychosis (Nasrallah, 2017). Chlorpromazine was the first drug to be developed and strongly bonded to all dopamine receptors (because the subtype receptors were not yet known). This bonding resulted in decreased firing in the mesolimbic area as well as the nigrostriatal area, contributing to decrease in symptoms of schizophrenia (e.g., delusions, hallucinations) as well as extrapyramidal symptoms (EPS) and Parkinsonian side effects. Because the dopamine receptor occupancy was persistent, it also added the risk of tardive dyskinesia and dystonia, thereby adding to the illness burden. First-generation antipsychotic drugs in this class include chlorpromazine (Thorazine®), perphenazine (Trilafon®), fluphenazine (Prolixin®), thiothixene (Navane®), thioridazine (Mellaril®), loxapine (Loxitane®), and haloperidol (Haldol®). With the Decade of the Brain in the 1990s, receptor subtypes were discovered that were distributed differentially throughout the brain and in proximity to each other, such as serotonin, norepinephrine, and dopamine (i.e., the monoamines), which formed specific pathways (Nasrallah, 2017). With the discovery of risperidone, and later clozapine, drug therapy began targeting the dopamine 2 (D2) receptor with brief occupancy paired with the serotonin 2A receptor (5HT2A). This mechanism contributed to an increase in dopamine in the nigrostriatal pathway, resulting in fewer EPS and less tardive dyskinesia. Differentially, by blocking the 5HT2A receptors that are near D2 receptors, there was more consistent dopamine firing in the cortical limbic pathway, resulting in improved positive—and to a lesser extent—negative symptoms. This new class of drugs was referred to as second-generation antipsychotics. These drugs were described as atypical dopamine blockers because they occupy the dopamine receptor briefly and are modulated by serotonin. Drugs in this class include risperidone (Risperdal®), clozapine (Clozaril®), olanzapine (Zyprexa®), ziprasidone (Geodon®), quetiapine (Seroquel®), asenapine (Saphris®), paliperidone (Invega®), iloperidone (Fanapt®), and lurasidone (Latuda®). One decade later, the pharmacodynamics became more refined in newer drugs that tend to modulate or stabilize dopamine, which are sometimes referred to as third-generation antipsychotics (Gonzalez, 2017). These drugs are partial agonists at D2 with much briefer occupancy and some antagonism of D2 as well as D3. They also differentially act on serotonin receptors 5HT2A, 5HT2C, and 5HT7. As of this publication, three drugs are available in this class: aripiprazole (Abilify®), brexpiprazole (Rexulti®), and cariprazine (Vraylar®). Aripiprazole, brexpiprazole, and cariprazine are all partial D2 agonists—they open the D2 receptor to receive dopamine that then fires the dopamine pathway. This action seems counterintuitive when the assumed pathology in psychosis is hyperdopaminergic activity. However, they also have D2 antagonist activity under hyperdopaminergic conditions; therefore, the mechanism serves to respond differentially in the limbic and frontal cortex pathways than the nigrostriatal pathway (Choi, Adham, Kiss, Gyertyan, & Tarazi, 2017). The additional partial 5HT1 agonist activity increases firing of the serotonergic pathway in the medial and dorsal lateral frontal cortex and hippocampus while there is receptor antagonism of 5HT2A and 2B. Altogether these mechanisms decrease negative and positive psychotic and manic symptoms and have anxiolytic and antidepressant effects. Finally, these dopamine modulators have modest antagonist effects on norepinephrine receptor alpha 1 for relief of anxiety and depression (Choi et al., 2017; Hope, Castle, & Keks, 2018; Kehr et al., 2018). Cariprazine stands out somewhat in that it also activates D3 receptors, which improves cortical wakefulness and alertness, not only contributing to relief of positive and negative symptoms, but also improving cognitive symptoms (Citrome, 2018; Duric et al., 2017). Brexpiprazole has more potent binding on 5HT2A, 5HT1A, and alpha 1B, resulting in less likelihood of akathisia and EPS, less activation than aripiprazole, and less sedation and weight gain due to minimal binding of the histamine 1 receptor (Stahl, 2016). Receptor affinity and binding are the key properties that distinguish the first-generation dopamine antagonists from the succeeding generation of drugs. Receptor affinity refers to the extent a ligand (i.e., any protein such as dopamine or a drug) binds to a receptor and activates neural firing. Occupancy is the amount of time it remains attached. Binding and occupancy determine the potency of a drug. 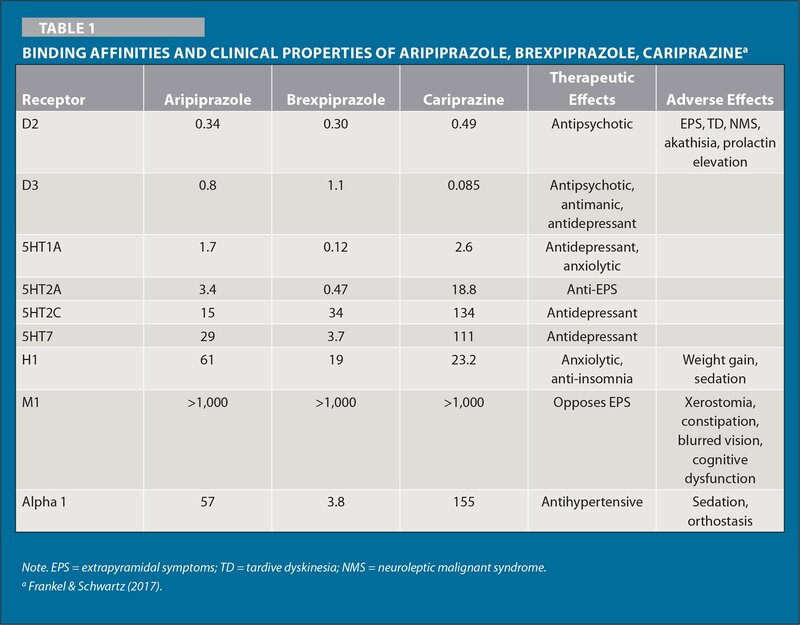 Table 1 shows the binding for aripiprazole, brexpiprazole, and cariprazine and all receptors involved. The lower the number, the stronger the affinity; therefore, the stronger the clinical effect (Frankel & Schwartz, 2017). Aripiprazole is approved by the U.S. Food and Drug Administration (FDA) to treat schizophrenia and bipolar disorder. Oral dosages start at 2 mg/day to 5 mg/day and the dosage is adjusted when used in augmentation with a serotonergic agent. For schizophrenia, the oral dosage ranges from 5 mg/day to 30 mg/day. There are also intramuscular and long-acting injectable formulations. Aripiprazole is metabolized by cytochrome p-450 enzymes 3A4 and 2D6. It has a half-life of 75 hours and 94 hours for the active metabolite, reaching steady state in 14 to 15 days (Frankel & Schwartz, 2017). Brexpiprazole is FDA approved to treat schizophrenia and major depressive disorder (MDD). Oral dosages start at 1 mg/day and are titrated up to 2.4 mg/day for schizophrenia and 0.5 mg/day to 2.3 mg/day for MDD. Brexpiprazole is also metabolized by 3A4 and 2D6 and has a half-life of 91 hours, reaching steady state in 10 to 19 days (Frankel & Schwartz, 2017). Cariprazine is FDA approved to treat schizophrenia and bipolar disorder. Oral dosages range from 1.5 mg/day to 6 mg/day to treat schizophrenia and 3 mg/day to 6 mg/day to treat mania. It is metabolized by 3A4 only. It has a half-life of 2 to 4 days and 1 to 3 weeks for the active metabolite (Frankel & Schwartz, 2017). The FDA approves drugs based on a pharmaceutical company's data submission, and therefore is limited to just the populations used in the studies. In clinical practice, the clinician makes prescribing decisions based on the pharmacodynamics of the drug and may use certain medications off-label for related clinical symptomatology. For example, aripiprazole has been shown to be effective in treating obsessive-compulsive disorder (Akyol Ardic et al., 2017), autism (Goel, Hong, Findling, & Ji, 2018; Ichikawa et al., 2017), attention-deficit/hyperactivity disorder (Razjouyan, Danesh, Khademi, Davari-Ashtiani, & Noorbakhsh, 2018), and Tourette syndrome (Sallee et al., 2017) in children with the advantage of low probability of metabolic syndrome. Aripiprazole has also been used to treat dementia and treatment-resistant depression (TRD) in older adults (Beyer & Johnson, 2018; Davies et al., 2018; Gebara et al., 2018). Aripiprazole has also been studied during pregnancy for schizophrenia, bipolar disorder, and TRD, and due to its minimal metabolic effects has been shown to have greater benefits than risks and is relatively safe to both baby and mother (Cuomo, Goracci, & Fagiolini, 2018; Damkier & Videbech, 2018; Galbally, Frayne, Watson, & Snellen, 2018; Park et al., 2018). These third-generation antipsychotics have been shown to be effective in augmentation to serotonergics with TRD (Cowen, 2017; Kamijima, Yasuda, Yamamura, & Fukuta, 2018; Nguyen et al., 2018; Romeo, Blecha, Locatelli, Benyamina, & Martelli, 2018). The most highly researched populations include individuals with schizophrenia and bipolar disorder in which these third-generation drugs were found to be especially efficacious with first-episode schizophrenia in reducing relapse (Wang et al., 2018) and overall efficacy with a better safety profile than second-generation antipsychotics (Ribeiro, de Mendonca Lima, Vieira, Storpiritis, & Aguiar, 2018). Third-generation antipsychotics show a lower mortality risk in incidence and life-duration (Taipale et al., 2018). These medications have been studied in treating bipolar mania in children and adults (Atkin, Nunez, & Gobbi, 2017; Calabrese et al., 2018), although one study showed lithium to be more effective than aripiprazole (Shafti, 2018). The most impressive distinguishing feature of this class of drugs is its side effect profile. The major concern with the early dopamine antagonists was the effects on EPS and contribution to Parkinsonian symptoms and tardive dyskinesia. The second-generation serotonin dopamine antagonists greatly reduced these risks with the added risk of metabolic syndrome. These latest dopamine modulators not only minimize EPS and tardive dyskinesia but also have reduced risk of metabolic syndrome and weight gain (Coughlin, Goldie, Tranmer, Khalid-Khan, & Trequnno, 2018; Nguyen et al., 2018; Nichol et al., 2018; Reynolds & McGowan, 2017). By improving the side effect profile, clients are more likely to continue to take these medications. With new medications, there are safer and more efficacious options available for clients, but at the detriment of higher costs that are less likely to be covered by third-party payers. Prescribers need to weigh the costs with the benefits and decide how to best advocate for clients. Best outcomes occur when clients collaborate in clinical decision making and maintain an effective treatment regimen. Unfortunately, with chronic illnesses of any kind, medication adherence is more challenging. Clients often forget to refill prescriptions, they become discouraged or frustrated with side effects, and they feel stigmatized by having a mental disorder. Long-acting injectables are becoming more available and are effective ways to assist clients with medication adherence. Nurses need to monitor for side effects, especially metabolic changes, and guide clients in their overall treatment. When prescribing, nurses must make reasonable decisions on medication choices by considering the pharmacodynamics and pharmacokinetics of available drugs that best fit the needs and preferences of the client. Citrome, L. (2018). Aripiprazole, brexpiprazole, and cariprazine: Not all the same. Current Psychiatry, 17(4), 24–33, 43. Gonzalez, R. (2017). Aripiprazole and brexpiprazole. In Schatzberg, A. & Nemeroff, C.B. (Eds. ), The American Psychiatric Association Publishing textbook of psychopharmacology (5th ed., pp. 731–754). Washington, DC: APA Publishing. Nasrallah, H. (2017). Classic antipsychotics medications. In Schatzberg, A. & Nemeroff, C.B. (Eds. ), The American Psychiatric Association Publishing textbook of psychopharmacology (5th ed., pp. 603–622) Washington, DC: APA Publishing. Shafti, S.S. (2018). Aripiprazole versus lithium in management of acute mania: A randomized clinical trial. East Asian Archives of Psychiatry, 28(3), 80–84.